A "Hebraism" is a typical feature of the Hebrew language found in another language. 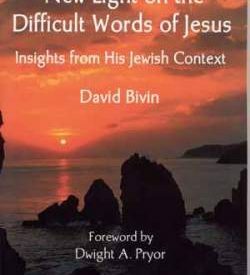 The majority of today's New Testament authorities assume that Aramaic is behind the Semitisms of the New Testament, and that Jesus spoke Aramaic as his primary language. So much so, in fact, that the student who checks standard reference works is informed that the Greek words for "Hebrew" and for "in the Hebrew language" (not only in the New Testament, but in Josephus and other texts) refer to the Aramaic language. “Hebraisms in the New Testament” was published in Encyclopedia of Hebrew Language and Linguistics (4 vols. ; ed. Geoffrey Khan; Leiden: Brill, 2013), 2:198-201, and is used here with Brill’s permission. A ‘Hebraism’ is a typical feature of the Hebrew language found in another language. In this article, the term is used to refer to a Hebrew feature found in the Greek of the New Testament (NT). The majority of today’s NT authorities assume that Aramaic lies behind the Semitisms of the NT, and that Jesus spoke Aramaic as his primary language. This is so much so, in fact, that the student who consults standard reference works is informed that the Greek words for ‘Hebrew’ and for ‘in the Hebrew language’ (not only in the NT, but in Josephus and other texts) refer to the Aramaic language (BDAG 270). Moreover, although Acts 22.2 specifically uses the expression τῇ Ἑβραΐδι διαλέκτῳ (tē hebraidi dialektō, ‘in the Hebrew language’) to refer to the language Paul is speaking at this point in the narrative, many English translations (e.g., NIV, NET) render these words as ‘in Aramaic’—even though the terms ‘Hebrew’ and ‘Aramaic’ are kept quite distinct in Greek texts from the period, such as the Septuagint (LXX) and the works of Josephus. Since the discovery of the non-biblical Dead Sea Scrolls manuscripts, about eighty percent of which are written in Hebrew (Abegg 2000:461), the Hebrew Bar-Kokhba letters, and other epigraphic materials, a reassessment of the language situation in the Land of Israel in the 1st century C.E. has taken place. It now appears that Hebrew was alive and well as both a written and a spoken language (Bar-Asher 2006:568-569). Scholars have begun moving in the direction of a trilingual approach, with three primary languages, Hebrew, Aramaic, and Greek, available for use (see, e.g., the ossuary inscriptions collected in Rahmani 1994). Hebrew served as the traditional language of the Jewish community; Aramaic served as the lingua franca of the Near East; and Greek served as the international lingua franca throughout the Mediterranean (Bar-Asher 2006:585). To be more specific, Aramaic was probably dominant in the Galilee, Hebrew prevailed in Judea, and a multilingual situation characterized Jerusalem, Caesarea, and other large cities. The result of this multilingual situation, especially for the topic at hand, is a host of Semitisms (both Hebraisms and Aramaisms) in the NT (for listings, see Howard 1920:411-485; Fitzmyer 1981:113-125; Davies-Allison 1988:1 80-85). Enlargement of an ossuary fragment discovered in Jerusalem bearing a Hebrew “Corban” inscription. Translation: “Any man who [intends to use] it [should regard] it as Corban [i.e., dedicated to the Temple].” Photo: Boaz Zissu. Courtesy of Boaz Zissu. Abegg, Martin G., Jr. 2000. “Hebrew language”. Dictionary of New Testament background, ed. by Craig A. Evans and Stanley E. Porter, 459-463. Downers Grove, Illinois: InterVarsity. Bar-Asher, Moshe. 2006. “Mishnaic Hebrew: An introductory survey”. The literature of the sages: Second part, ed. by Shmuel Safrai, Zeev Safrai, Joshua Schwartz, and Peter J. Tomson, 567-595. Assen: Royal Van Gorcum and Minneapolis: Fortress Press. BDAG = Bauer, Walter, Frederick W. Danker, William Arndt, and Felix W. Gingrich. 2000. A Greek-English lexicon of the New Testament and other early Christian literature. 3rd edition. Chicago: University of Chicago Press. Buth, Randall. 1990. “Edayin/Tote—Anatomy of a Semitism in Jewish Greek”. Maarav 5-6:33-48. Buth, Randall and Kvasnica, Brian. 2006. “Temple authorities and tithe evasion: The linguistic background and impact of the parable of ‘the vineyard, the tenants and the son'”. Jesus’ last week: Jerusalem studies in the synoptic gospels, ed. by R. Steven Notley, Marc Turnage, and Brian Becker, 53-80, 259-317. Leiden: Brill. Davies, William David and Dale C. Allison, Jr. 1988. A critical and exegetical commentary on the gospel according to Saint Matthew (International Critical Commentary). Edinburgh: T. & T. Clark. Eshel, Hanan. 2006. “On the use of the Hebrew language in economic documents from the Judean Desert”. Jesus’ last week: Jerusalem studies in the synoptic gospels, ed. by R. Steven Notley, Marc Turnage, and Brian Becker, 245-258. Leiden: Brill. Fitzmyer, Joseph A. 1981. The gospel according to Luke (Anchor Bible Commentary). Garden City, New York: Doubleday. Grintz, Jehoshua M. 1960. “Hebrew as the spoken and written language in the last days of the Second Temple”. Journal of Biblical Literature 79:32-47. Howard, Wilbert Francis. 1920. “Semitisms in the New Testament”. A grammar of New Testament Greek, ed. by James Hope Moulton, Wilbert Francis Howard, and Nigel Turner, vol. 2, 411-485. Edinburgh: T. & T. Clark. Joosten, Jan. 2004. “Aramaic or Hebrew behind the gospels?” Analecta Bruxellensia 9:88-101. ____. 2005. “The ingredients of New Testament Greek”. Analecta Bruxellensia 10:56-69. Joosten, Jan and Menahem Kister. 2010. 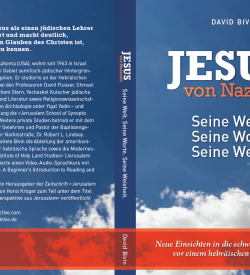 “The New Testament and Rabbinic Hebrew”. The New Testament and rabbinic literature (Supplements to the Journal for the Study of Judaism 136), ed. by Reimund Bieringer, Florentino García Martínez, Didier Pollefeyt, and Peter J. Tomson, 335-350. Leiden: Brill. Kutscher, Eduard Yechezkel. 1977. Hebrew and Aramaic studies (Hebrew, and English). Jerusalem: Magnes. ____. 1982. A history of the Hebrew language. Jerusalem: Magnes and Leiden: Brill. Rahmani, Levi Yitshak. 1994. A catalogue of Jewish ossuaries in the collections of the State of Israel. Jerusalem: Israel Antiquities Authority and Israel Academy of Sciences and Humanities. Safrai, Shmuel. 2006. 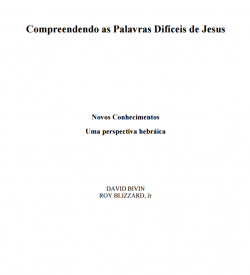 “Spoken and literary languages in the time of Jesus”. Jesus’ last week: Jerusalem studies in the synoptic gospels, ed. by R. Steven Notley, Marc Turnage, and Brian Becker, 225-244. Leiden: Brill. Sokoloff, Michael. 2002. A dictionary of Jewish Palestinian Aramaic of the Byzantine Period. Ramat-Gan: Bar Ilan University Press. Wilcox, Max. 1992. “Semiticisms in the New Testament”. Anchor Bible Dictionary vol. 5, 1081-1086. Zissu, Boaz and Amir Ganor. 2007. “A new ‘qorban’ inscription on an ossuary from Jerusalem” (in Hebrew). 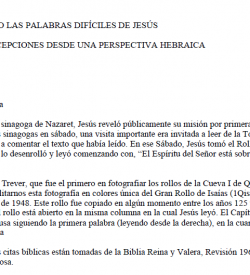 Cathedra 123:5-12, 193.